A good friend kept pointing me at fivethirtyeight.com for statistician extraordinaire Nate Silver’s (and team’s) views on the World Cup. In particular, he really thought I should read the following article (Why Isn’t the U.S. Men’s National Team Better at Soccer?) and that it would be interesting on an analytical level. So I did. The problem was, I came in biased. And that’s how I left. And I wouldn’t have it any other way. I knew from there on I was going to struggle to maintain an open mind because I immediately formed a couple serious concerns. First, this presumptions, misplaced opening premise starts the reader on the easy, but not particularly well-informed path that the USA isn’t good at this “foreign” sport. Second, the desire to turn soccer into another statisticians dream the way Money Ball changed baseball frightens and dismays me. Mr. Silver’s website has lots of new World Cup coverage, and I’m sure it’s all quite thorough. There are percentages on what teams will advance, what games will be ties and other statistical discussions that can make newbies to the game sound smart at a cocktail party or at the office water cooler. I don’t find such soccer statistics a thing of beauty. And I don’t really want them coloring my view of the beautiful game. I hope they are wrong. And I love when it the numbers don’t tell the story. Like today. The site predicted only 19% change of a Germany/Ghana tie and thought Argentina vs. Iran would turn into a blowout victory for the South Americans. Very logical. What happened? A Germany/Ghana tie. And a last second goal by Lionel Messi to save Argentina from an unexpected scoreless tie. The unpredictability of those results made the day much more fun. The beauty of the game comes from the decisions that need to be made on the field, by players, in real-time. It’s a game of emotion. Of momentum. And yes, of luck. There are few plays to be run from a playbook. Limiting the number of plays where success or failure can be tracked. Can you predict pulled hamstrings, goals that happen within the first 30 seconds, the humidity or field conditions? 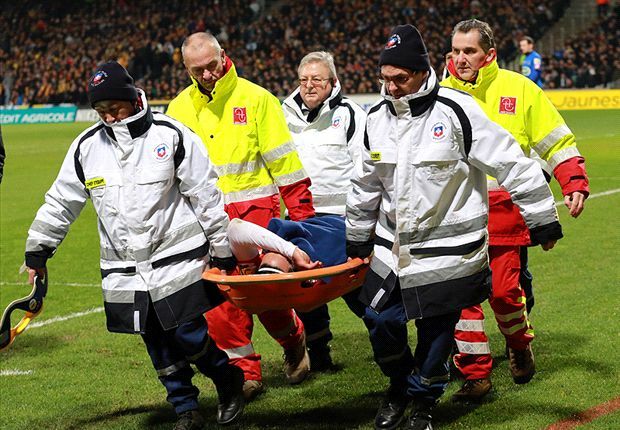 Can you predict players getting broken noses or head-butting one another? Can you predict a poor decision by a referee? Maybe in aggregate all of these things can be calculated, predicted and analyzed. I hope not, because there’s more to a fluid team sport than any of that. Especially a team sport that leaves so much responsibility on the hands of the players. Not play calling. What variable/value is assigned to team spirit, exactly? Not so easy. 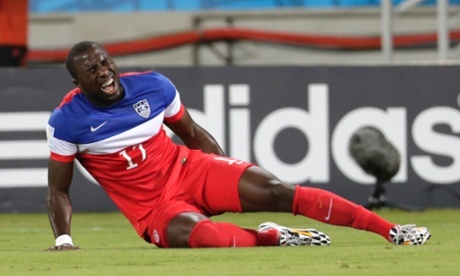 Did the USA outplay Ghana in its first game of this World Cup? No. But did it display an unbelievable commitment to each other on the field? Absolutely. And that proved to be enough. On that day. On that field. In this competition. I don’t think that this game is predictable. And I hope it never is. Despite all of my internal rejection of the ‘numberization’ of my chosen sport, the article’s premise was just as troubling as the fact that it was searching for something to analyze. The overly-Americanized and ridiculously presumptive title started me down a path that’s hard to recover from. Wow. What a question. How much better should the USA be exactly? The game against Ghana was clearly more grit than beauty… and I do not think the USA is the World’s best team, but how much better are we talking about, specifically? Germany, I presume, is considered way better that the USA. And today, they tied the team we beat a few days back. One measure of being “better” means getting results in the World Cup, right? The USA has qualified for every World Cup since 1990. (Yes, in 1994 we did not need to, as hosts.) This success is disregarded, since people think that our region is easy to qualify from. Mexico, of our region, just tied Brazil. How good are they? Yeah, we qualified ahead of them. 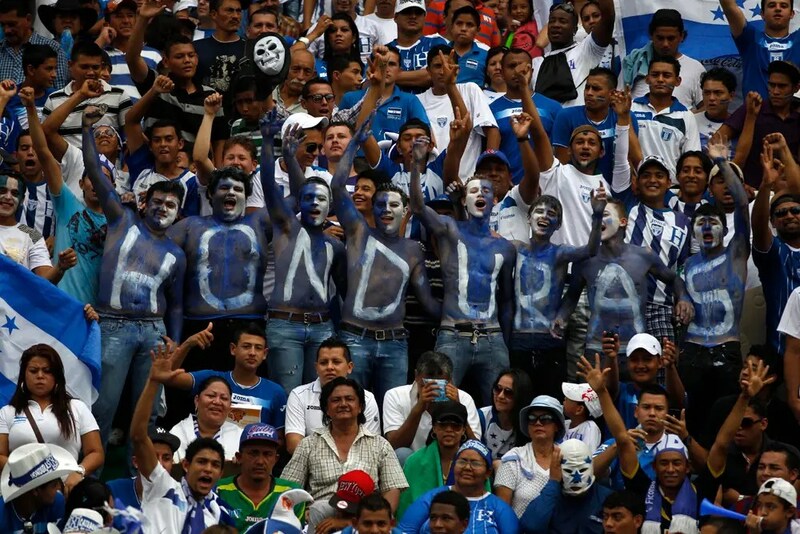 Costa Rica, of our region, has already qualified for the second round beating both South American and European foes. Yeah, we qualified ahead of them too. And for Euro-soccer Snobs that think our region is easy to qualify from, I suggest they play some competitive matches in San Jose, Costa Rica, Tegucigalpa, Honduras or in Azteca Stadium in Mexico, and see what they think afterward. Think it’s easy? Read this. But the article asks, why aren’t we “better.” Perhaps that means we need to beat the best teams in competition. However, in REAL competitions, we’ve beaten Argentina by 3 goals (Copa America), stopped Spain’s ridiculously long winning streak (Confederations Cup), beaten Mexico and Portugal in World Cup play. Is that not enough? 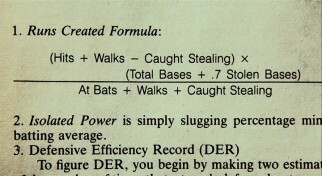 When, exactly, will we qualify as being good enough for the statisticians to go back to baseball. I get that in some way statistics may help explain soccer. But having some foundational knowledge and understanding of the game – and its frustrating intricacies – might help form some better hypotheses to begin with. During World Cup coverage, when players leaving the field, ESPN (who’s coverage has been quite good, actually) shows me how much the player has run. As if that’s a metric of success. We now see team possession statistics that aren’t particularly useful either, in my view, since for some teams it is a strategy and for others it is a necessity that happens without any meaningful offensive moves. We now see percentages of passes completed. Interesting, but flawed. One beautiful pass can be worth ten simple ones. And please, don’t ask why the USA “aren’t better” unless you are willing to describe what better looks like. Because the USA can and should get better, but I don’t think our improvement will be driven by a calculator and an algorithm. So please, keep your statistics off in a fantasy league corner. 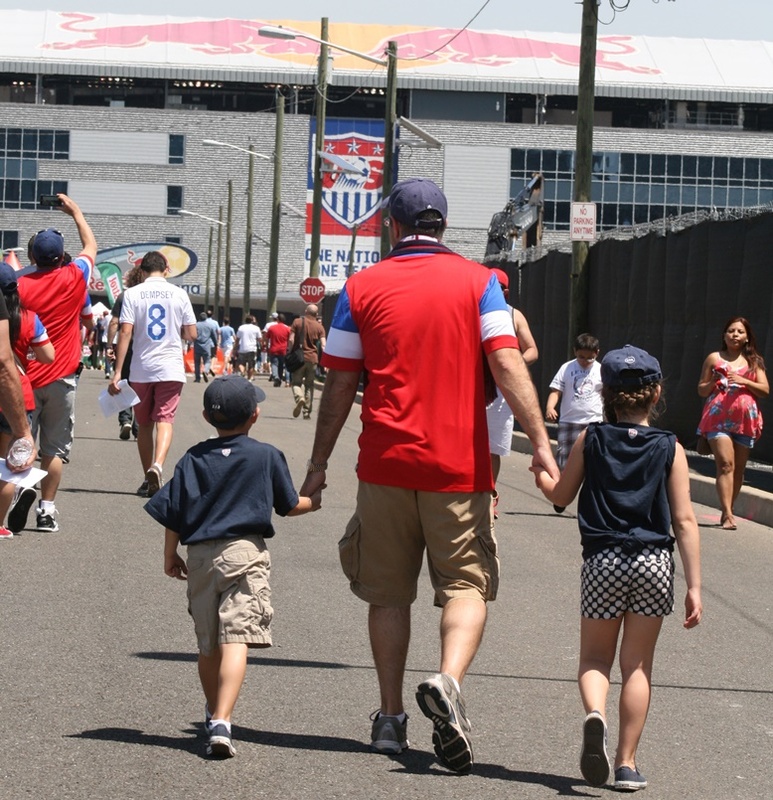 If you haven’t noticed, the USA is developing a passion for the beautiful game. Let’s not bury it in, largely meaningless, numbers. I plan to remain with my head firmly in the sand. Preferring emotion to calculation. And beauty to analysis. Yes, in my soccer book collection I have (and enjoyed) Soccernomics, by Simon Kuper and Stefan Szymanski. But my favorite will always be “Soccer in Sun and Shadow” by Eduardo Galeano. That’s what computes for me. I’ve not written a thing on this blog in over a year. But I’ve clearly got plenty to blog about. It’s a game day for the US Men’s National Team. Landon Donovan. And heck, my two <10 year olds got their first “cap” last week. We’re on the cusp of a Brazilian World Cup and stars are dropping like flies in pre World Cup tune up matches. My adopted 2nd nation of Colombia has finally realized it has lost Falcao, but has a chance to advance nonetheless. My first visit to Old Tafford came not long ago. Cool. And heck, the 2014 New England Revolution are, well, thoroughly watchable. I have more than enough reason to rejoin the >140 character world of self-expression with relevant, meaningful and heartfelt ideas about soccer, the meaning it has on life, love and the world around us. So what topic came to me in the shower the other day that finally tipped the scales for me to sit down and clack away at the keys? It’s not any of those wonderful topics. It’s hardly even a relevant topic at this juncture. In fact, it’s the US Soccer’s third-rail. I’m almost serving up a troll’s paradise for my own ridicule and clear soccer illiteracy just by going here. I know, I know. But, bear with me, I think I’ve got an interesting twist on this one. You see, this article is NOT about Freddy being a washed up player who should pack it in. Nor is it about his incredible skill and the fact that just some bad contracts and unlucky breaks lead him to his current, club-less position. Clearly, neither of those are completely true. At least not to me. And I’ll go on the record and say that I’ve written more on Soccer Soap Box about Freddy in the past than is probably warranted or logical given his frustrating flirtations with the US National Team, confusing MLS tenure and unsuccessful stays abroad. The most obvious of this vintage was “Much Adu About Something?” which gives you plenty to throw stones at, as a perspective from December 2009, but there are others. So, it’s clear. I have a curiosity and interest in Freddy’s career. Probably more than justified. So be it. But the other day, with thoughts whipping around about Julian Green being included, and Landon Donovan being discarded, from the US team, I began thinking of other young talents that need to be watched. New England’s own Diego Fagundez central to those thoughts. It brought me back to Freddy, and the tale of what went wrong and what could have been. If you don’t believe he can play, stop reading. Because, while none of what follows is an argument on why he is “the saviour”, it is built upon the idea that Freddy can play. My evidence? You don’t get to the Olympics, National Team, MLS, Benfica contracts, etc. on marketing alone. Argue if you’d like, but check out these quick clips to remind us of Freddy with the USMNT. Flip to 2 minutes and 52 seconds of this one. He was (is?) a good bit better than terrible. Freddy, has a one-liner on his gone-pretty-quiet Twitter account that popped into my mind. 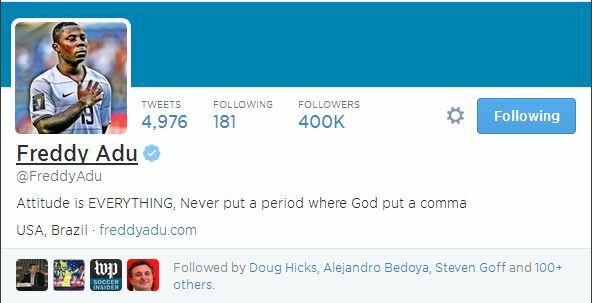 “Never put a period where God put a comma.” And I suppose he’s praying that’s true. OK, religion is not my specialty, but it got me thinking, how on earth do you turn that period in Freddy’s career into a comma. Most MLS coaches are probably not interested in the headache created by his return. He’s probably too proud to play in a lower-level US Club. He doesn’t have the best international track record. So now what? Is there a way out? Then, it hit me. Why not leverage the machines that made (and ruined?) him to resurrect him. Forget miracles, think ‘Murica: Marketing and money. A club team that wants to get some “noise” generated about it, but cannot be seen as being desperate. A club that has a sister/mother club where a player can prove himself in some harsher-than-MLS conditions. Or at least interest-generating conditions. A motivated Freddy Adu interested in a) regaining some former glory, b) playing the sport he loves, c) cashing in one last time, just in case. Or, D) all of the above. A creative agent and an even more creative contract, built largely on future performance. Sponsor logos and product placements, lots of them. And now imagine, cameras. Lots of cameras. 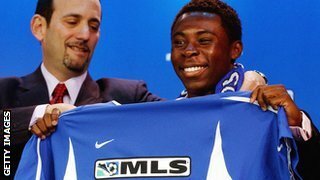 Freddy Adu signs with MLS “Team X” (we’ll get back to that) on short-term “All Star Trial” contract. With lots of options that follow the trial period. Included in the contract is an agreement for a “The Freddy Experiment” (or whatever it would be named), a reality show based on Freddy’s “trial period.” Imagine the cameras tracking Freddy’s good days, and bad. Playing and living. Confessionals. Girl troubles. Whatever. The whole sickening reality TV gambit. At the end of the trial period, decision time on the options. The contract meetings include the league, the team, the player and agent and two few key others: representatives from the companies MLS just signed a big TV deal with, Soccer United Marketing, and interested league sponsors. Sponsors could be integrated into the show the way Spanish television has done for years. He drinks Gatorade. He plays EA Sports games on his Panasonic TV to relax. Wears Adidas. Uses a Visa card to pay for life’s needs. Calls home with AT&T. Heck, you can even build in (raising the sum you’d need to pay Freddy up front), some “goodwill” or prove yourself events as part of the trial/show. Go use Makita tools from the Home Depot to build a house and help the poor via an MLS Works project. Reality is, as we all know, MLS owns player contacts, so it could run the show and decide later. The end contract could be provided to a club at a reduced cost and a lottery. This way MLS gets the maximum sponsorship control and flexibility. But, unless some odd exceptions are made, that probably breaks plenty of MLS/team player distribution rules. And you lose the idea of a team gaining its own publicity, which is probably a major selling point. The best option is probably Chivas USA. Of course, that is if the club has a real future, a concern at this point. But why such a great fit? It’s hard to think of a team more in need of “buzz” than Chivas USA. The trial period could be with Chivas Guadalajara, a perfect environment for a story line of “prove yourself” in another world. You could probably craft both English and Spanish versions of the show. Call it “Sueño Adu” or something to build off of the very Latino-market focused “Sueño MLS” which is already in place. MLS could leverage an Americanized name in the USA for the show, and get both Univision and one of the American networks onboard. If it actually works out, he could fit within a more Latin-style playing scheme the team should be leveraging. BeckhamFC: Whatever this team will be called, it has time to build this story and campaign. It has David’s connections to get a trial situation set up. And c’mon, David could cameo on the show and be part of the story line to build interest. Maybe he’s the Donald Trump of the decision meeting? NYFC: One more way to leverage the media and marketing capability of the New York market. No commitment. Build Buzz. Imagine rainy scenes from a Manchester City reserve practice showing if Freddy has the commitment… compelling, no? Red Bull USA: Take the above, and turn Manchester into Salzburg, Austria. It works. Us this as a way to keep headlines while NYFC starts stealing attention. I sense the Cosmos could weasel their way into this discussion somehow, because, credit where credit is due, they seem to be a creative bunch even if not at the top-level of US professional soccer. Ironically, I don’t see a terrific play for my local New England Revolution unless Freddy goes to Patriot’s Training Camp. Though… given Mr. Kraft’s interests and portfolio, anything’s possible. And why shouldn’t we, the global-we, try to make this work? Because whether you like him, dislike him or wish never to think about this again, this our our journey as US soccer fans. And we don’t leave a man behind. Nor do we miss a marketing opportunity. And maybe that’s more important here. So maybe it’s true what Freddy says. It’s God that puts in commas. Freddy’s career needs a miracle and some prayers. But I’d be glad to see something work. Is this the route to his resurrection?